In this issue... First off, I owe a debt of thanks (and a wealth of swag) to the Patrons, without whom it would be very difficult to commit to the 5 months that this project requires! They are Anonymous, Linda Albertano, Thomas Brod PHD, Georgia Cox, William Craychee, Sue Crisp, John Davis, Liz Jackson, Frank Kearns, Hiram Larew, Lyn Lifshin, Heather Lowe, Steve & Michael Meloan, and Micheal West. More info continued after ordering section. 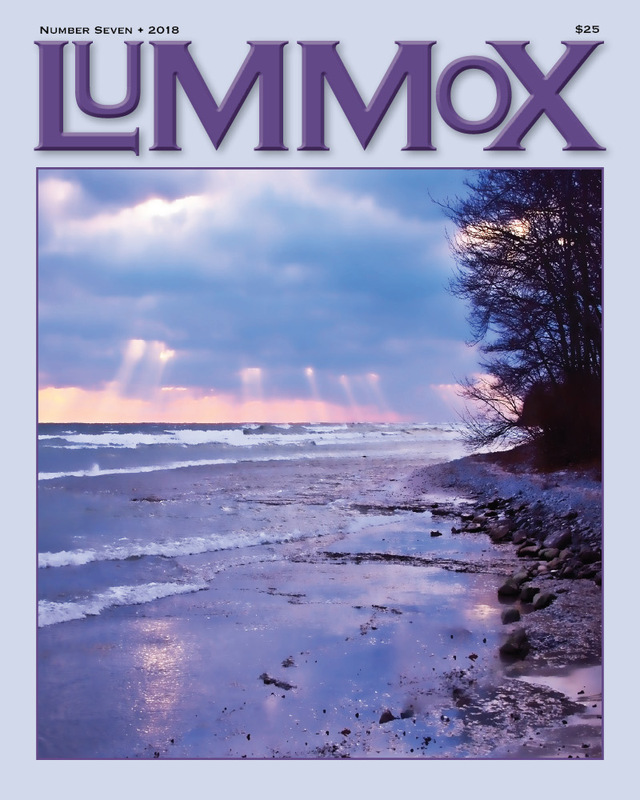 To order a copy of Lummox 7 by card, use the “buy now” button below (it has a pull-down feature, so make sure you select the correct amount; the top price is for the USA -$25– and the bottom price is for orders outside the US, i.e. the World -$42). All prices are in USD. 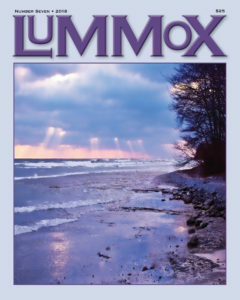 To order by check, please make it out to Lummox Productions in the amount of $25.00 for USA, or $42 for outside the US (the World) and mail it to Lummox, 3127 E. 6th St. Long Beach, CA 90814. Mike Adams, Roy Adams, Jeff Alfier, Tobi Alfier, George Anderson, RD Armstrong, Chris Barnes, Belinda Berry, Genevieve Betts, Chris Bodor, Brenton Booth, Debbi Brody, Lynne Bronstein, Dereck Brown, Dr. Patricia Brown, April Bulmer, Wayne Burke, Helmut Calabrese, Don Campbell, Pris Campbell, Francine Caron, Alan Catlin, Chuka Susan Chesney, Jackie Chou, Jonathan Church, Wanda Clevenger, Sharyl Collin, Patrick Connors, Gaiyle J. Connolly, Kit Courter, Henry Crawford, Bill Craychee, Sue Crisp, Steve Dalachinsky, Lucia O. Damacela, Sterling Davenport, James Deahl, Seven Dhar, John Dorsey, Jennifer Dunlop, Alicia Viguer-Espert, Mark Evans, Alexis R. Fancher, Joe Farley, Kate Flaherty, Jennifer Foster, Roseanna Frechette, Bill Gainer, William Galasso, Martina Gallegos, John Gardiner, Katherine Gordon, Jonathan Greenhause, Kenneth Greenley, Vijali Hamilton, Charles Harmon, Clarinda Harriss, Debbie Okun Hill, Gil Hagen Hill, Eryn Hiscock, Lori Holloway, Keith Inman, I. B. Iskov, Gary Jacobelly, Ellen Jaffe, Paulette Johnston, Jay Jones, Frank Kearns, lalo kikiriki, Linda King, Diane Klammer, Ronald Koertge, Raundi Kondo, Maureen Korp, Andrew Lafleche, Tom Laichas, Michou Landon, Donna Langevan, Gayle Lauradunn, Kyle Laws, Marie Lecrivain, John B. Lee, Linda Lerner, Bernice Lever, Lyn Lifshin, Norma Linder, Jane Lipman, Ellaraine Lockie, Ron Lucas, Cynthia Lukas, Radomir Luza, Argos MacCallum, John Macker, Mike Mahoney, Jesus Maya, Mori McCrae, Michael Meloan, Steven Meloan, Mary McGinnis, Basia Miller, Joe Milosch, Tony Moffeit, Deborah Morrison, Laura Munoz, Evan Myquest, Linda Neal, Ben Newell, normal, Norman Olson, Scott Thomas Outlar, Lorine Parks, Jeannine Pitas, Charles Plymell, Pam Plymell, D. A. Pratt, C.J. Prince, Kevin Ridgeway, Christopher Robin, Judith Robinson, Dave Roskos, Jennifer Dunford-Roskos, Georgia Santa Maria, Patti Scruggs, Michael Seeger, Eric Shaffer, Nancy Shiffrin, Lucille Shulklapper, Linda Singer, Judith Skillman, Jerry Smaldone, Rick Smith, Clifton Snider, Donna Snyder, T. K. Splake, Jeanine Stevens, Cynthia Stewart, Carl Stilwell, Phil Taggert, Lynn Tait, H. L Thomas, Murray Thomas, Tim Tipton, Anna Totta, Wyatt Underwood, Ed Valfre, Rolland Vasin, Grace Vermeer, Richard Vidan, Linda Whittenberg, Pamela Williams, Scott Wozniak, Chris Yeseta and Felice Zoota-Lucero. This entry was posted in Uncategorized on July 27, 2018 by bookdog.